From its debut in April 2010, Adventure Time has been a pop culture phenomenon. Within its four short years, the animated series has become a transmedia empire that encompasses toys, comics, games of all mediums, cosplay, and a vivid assortment of fan fiction and art across the internet in honest ways not seen before. A testament to the show's sincerity and personal bond with audiences, Adventure Time fandom has forged connections to the brand that in ways defy traditional expressions, genre labels, gender distinctions, and ages. This is reinforced with director Guillermo del Toro's brilliant, contextual introduction to the book. 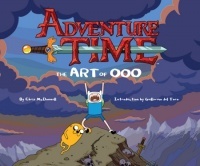 Now, with Adventure Time: The Art of Ooo, fans of the show have the book they have so long deserved. Divided into five chapters, Adventure Time: The Art of Ooo is more than simply a collection of screencaps and episode summaries. Instead, it is a behind-the-scenes investigation into the show's inception and glimpse at the creative process that drives the show. Not an encyclopedic survey of the episodes or character guide, Adventure Time: The Art of Ooo begins at the beginning with creator Pen Ward's personal artwork, sketches, and early comic strip Bueno the Bear, which served as a template for Adventure Time. Taking fans through Ward's upbringing and time in animation school, Chris McDonnell surveys how Adventure Time landed at Frederator Studios and provides readers with an in-depth look at the series Pitch Bible that was given to Cartoon Network. Interspersed throughout this section are commentaries by Ward and his team Pat McHale, Eric Homan, Rob Sorcher, Derek Drymon, and various Cartoon Network executives, each providing insight into how the show developed and changed from a viable pitch into an ongoing series. The meticulous time and effort of McDonnell into collecting these histories and including Ward and Phil Rynda's "How-to-Draw" guides are to be commended. If this were not enough, McDonnell also interviews the artists, designers, and storyboard artists who work on the show. Fan favorites such as Jesse Moynihan, Tom Herpich, Jack Pendarvis, Andy Ristaino, Rebecca Sugar, Ako Castuera, Seo Kim, Matt Forsythe, Adam Muto, Cole Sanchez, and many more all provide commentaries on episodes, character design, and story writing, and McDonnell includes their never-before-seen concept sketches, storyboard pages, designer tests, and Post-it note revisions. Recognizing how many of the show stories originate with personal experiences of these artists strengthens the bond the show has with its fans and McDonnell does an exemplary job of illustrating these connective tissues, particularly with the section on fan art from comic professionals such as Brandon Graham and show crew members to illustrators online. Also included are brief interviews with the voice actors behind Finn, Jake, Marceline, and more. Jeremy Shada (Finn), John DiMaggio (Jake), Olivia Olson (Marceline), Hynden Walch (Princess Bubblegum), Jessica DiCiccio (Flame Princess), Tom Kenny (Ice King), Justin Roiland (Lemongrab), and Niki Yang (BMO & Lady Rainicorn) to even James Baxter, all discuss their characters and relationships to the series. If there is but one minor criticism of Adventure Time: The Art of Ooo, it is that the section on music is simply too short. Beginning on page 263, interviews with Sugar and Moynihan are complemented with interviews with composers Tim Kiefer and Casey Basichis; however, they are much too brief to allow deeper analysis. Fortunately, this gap has been filled by the Season Four DVD release special feature that focuses on the show's musical composition. McDonnell deserves credit for producing such a worthy endeavor that encompasses nearly every facet of this multidimensional series. Special attention should also be paid McDonnell for incorporating so many of the creative talents behind the show and giving them a vocal platform throughout the narrative. A nice compliment to and one that goes beyond Titan's Adventure Time: The Original Cartoon Title Cards Vol. 1, this book cannot be recommended highly enough for diehard and casual fans alike of the show.